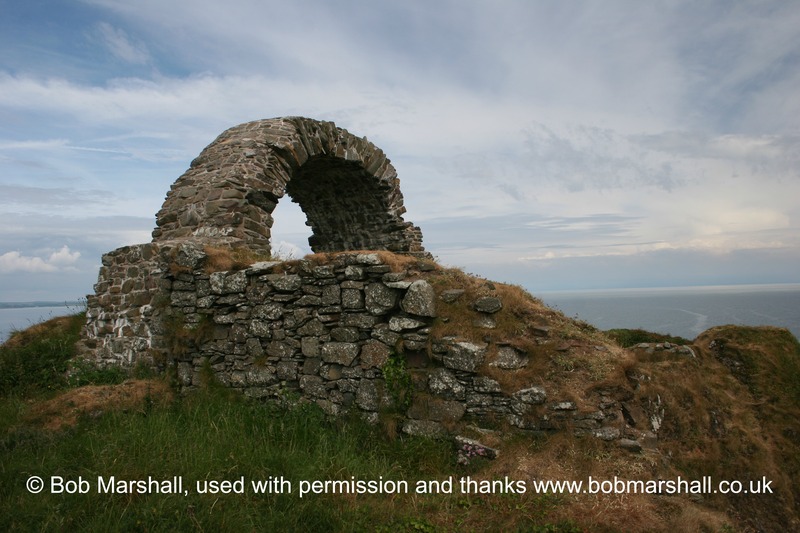 Cruggleton Castle can be found on a clifftop promontory overlooking Wigtown Bay in Galloway a few miles to the south of Wigtown. Just over half a mile to the north the cliffs drop down to the sandy Cruggleton Bay, and to the south they are broken by the outpouring of Palmallet Rock. The views from the site appear to have been the primary reason for the location of the castle here, since it is overlooked by higher ground inland, and there appears to be no wider local strategic logic. The castle is defended by a ditch some 12 metres wide and 2 metres deep which cuts the promontory off from the surrounding land, and which has a break towards the south-western end. This break is a causeway about 4 metres wide, which follows an L-shape, with the ground level falling away towards the sea as well as to the ditch. Further to the east, the ground rises again about 4.5 metres to an inner motte-like feature at the edge of the cliff. At the northern end of this, there are suggestions of a ditch at its base. The outer ditch almost certainly belongs to the earliest, Iron Age, use of the site, when a timber round house occupied the highest point of the castle, and it is unlikely that there was ever much in the way of medieval defences augmenting the ditch; the width of the causeway is too great. A second phase of occupation dates to perhaps the 8th century, when a timber hall and palisade were erected on the summit. Similar structures occupied the site until the mid 12th century. The dates indicate that this simple construction was maintained into the time of the early Lords of Galloway, Fergus and Gilbert. After Gilbert’s death in 1185, Galloway was split and his nephew Roland ruled over Cruggleton until 1200. At this date he was succeeded by his son Alan. Alan was a powerful man and held the position of Constable of Scotland. Towards the end of the 12th century or early in the 13th, the summit area was levelled through the addition of shale and rubble, and a timber tower measuring about 4 metres square erected at the north end. The palisade, perhaps no longer serviceable, was removed, but the timber hall was retained and extended at the southern end of the site. It seems most likely that Alan was responsible for this work, some of the post holes of his tower can still be seen on site. In 1235, Alan died without a legitimate male heir, and Galloway fell to his daughter Devorguilla and her husband John Balliol of Barnard Castle. Some time in the latter 13th century, the castle was refortified, the work involving a stone curtain wall and tower some 15 metres by 9. It is likely this was the work of the Balliols or their relatives the Comyns, who are recorded as occupying Cruggleton in 1282. By 1289, when it was captured by Edward I of England, there were reportedly 8 towers requiring lead for their roofs, traces of which have not been identified, but one of which may be the ruined tower at the northern end of the summit. When King John abdicated, it was held by Henry Percy until 1313, when it was captured by Bruce, and then granted to William de Soulis until his forfeiture in 1320. It is likely that the castle was then sacked during the wars with England, but there is no record detailing its fate. In 1424 it was granted to the Abbey of Whithorn, who rather surprisingly appears to have refortified it as a vaulted stone tower measuring 9.4 x 8.6 metres externally. At the Reformation it was seized by Lord Robert Stewart, an illegitimate son of James V, who was promptly besieged by Lord Fleming, who also had his eye on the property. Stewart remained as lay prior of Whithorn, and maintained the castle, which was recreated in a drawing of c1563 known as the “English Spy” drawing. This shows the tower, courtyard wall, 16th century sloping battlements, and buildings within, as well as a defence along the outer ditch causeway area. In 1606 Cruggleton passed to the MacDowalls of Machermore, who soon sold it to the Kennedy family of Blairquhan. In 1620 it then became the property of the Agnews of Lochnaw, who were relations by marriage. Ultimately it seems likely that he castle fell into disrepair or was damaged during the Bishops Wars, because it was described as ruinous in 1680. Alternatively it seems possible that part of the castle fell over the cliffs in a storm as the southern end of the tower has disappeared. Today the castle is accessible at all times, although care should be taken because of the exposed clifftop site.